Rachel: They told me you never take anything seriously. Sam: I take a lot of things seriously. Sam: Quantum physics and time travel. "Theorizing that one could time travel within his own lifetime, Doctor Sam Beckett led an elite group of scientists into the desert to develop a top secret project, known as Quantum Leap. Pressured to prove his theories or lose funding, Doctor Beckett prematurely stepped into the Project Accelerator and vanished. He awoke to find himself in the past, suffering from partial amnesia and facing a mirror image that was not his own. Fortunately, contact with his own time was made through brainwave transmissions with Al, the Project Observer, who appeared in the form of a hologram that only Doctor Beckett could see and hear. Trapped in the past, Doctor Beckett finds himself leaping from life to life, putting things right that once went wrong and hoping each time, that his next leap will be the leap home." 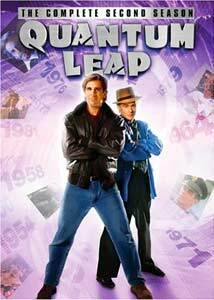 Following the surprising success of its initial eight-episode season, Quantum Leap received a full order of 22 episodes for its second year. While the writers still were developing the Al-Sam dynamic and the best aspects of the series, this collection provides a strong group of interesting stories. The season begins with the unique Honeymoon Express, which presents Al struggling to renew the funding for the Quantum Leap Project. Meanwhile, Sam is attempting to save the life of the striking Diane McBride (Alice Adair), whose fate may play a role in keeping the project alive. This tale nicely shifts from the mold by showing Al in his present time working with the bureaucrats who understandably are skeptical about Sam's journey. The structure increases the show's depth and allows it to avoid (for at least one episode) the typical formula. The basic stories following a similar pattern: Sam (Scott Bakula) leaps into a new person and must attempt to adapt to the new environment with little knowledge of his identity. Eventually, Al (Dean Stockwell) arrives to provide more information about the time period and to present the computer Ziggy's opinion concerning Sam's mission. The episode's second half brings the central conflict to the forefront and showcases our hero's often ingenious methods to save the day. Failure is generally not expected, and the suspense arises from guessing how Sam will find a way to change history for the better. This season marks a significant improvement over the first year, but the stories still vary considerably in quality. The best entries avoid the typical movie-of-the-week fare and showcase Sam within a unique, energetic situation. A prime example is Good Morning, Peoria, an enjoyable tale in the vein of Footloose where Sam helps the Illinois town to accept the excitement of rock 'n' roll. Leaping into DJ Howlin' Chick Howell, Sam quickly adjusts to the over-the-top style of a late '50s radio personality. Patricia Richardson makes an inspiring pre-Home Improvement appearance as the station manager and his love interest, and the result is a fun experience. This tale provides nothing groundbreaking within the series' larger story, but its string of rockin' hits should inspire some toe-tapping from viewers. This solid season generally sticks to the one-off episode formula, which can be frustrating for repeat viewers but is easily accessible to new audiences. The formula does vary considerably with the compelling season finale M.I.A., in which Al's difficult past comes to light through Sam's attempts to keep hope alive for a soldier's wife. The emotionally gripping final scene is one of the series' best, and it leads well into the more creative final three seasons. Those years would take more chances with the typical format and raise the show to a higher level. Quantum Leap does incorporate a large dose of optimism and straight-arrow corniness, but its unique structure helps to generate intriguing stories. The strong dynamic between Scott Bakula and Dean Stockwell raises many average tales beyond their script, which makes this season a worthwhile experience. Image Transfer Review: Quantum Leap: The Complete Second Season utilizes adequate full-frame image transfers, but they include a significant amount of grain that lessens the effectiveness. The picture quality is barely improved over the television airings, which is a disappointing aspect. The colors are bright enough to keep things from becoming too distracting, but the transfers could have used a few enhancements to really shine. Audio Transfer Review: This release provides each episode with a solid 2.0-channel stereo transfer that presents the dialogue effectively. The sound effects and music are not very powerful, but they do emit clearly from the front speakers. The audio moves little between the speakers and remains centralized, but the overall presentation is at least acceptable. Unfortunately, the rating for this transfer must be downgraded due to Universal's replacement of pivotal music tracks to save money on securing the rights to these songs. The most notable instance is the removal of Ray Charles' Georgia on My Mind from the M.I.A. season finale, which causes significant damage to the story. These changes may not be noticeable to the casual viewer, but they still hamper the series' success. Extras Review: This three-disc set includes no extra features, which is a major disappointment for the series' fans. While I would not expect to see a large collection of supplements with this type of release, at least an interviews featurette would have been acceptable. Instead, the only items included are a few preview trailers before the main menu, which are never a welcome sight. The arrival of Quantum Leap: The Complete Second Season should generate excitement for the series' many devoted fans, but the lack of extra features and Universal's removal of some essential music cues casts a dark cloud over this release. It is even more frustrating to note that the studio has chosen to avoid mentioning the changes to the consumer. If these alterations bother you, it might be a wise choice to avoid purchasing this collection. The show itself deserves a recommendation, but the overall product is not up to the necessary standards for DVD releases.